New Jersey state Senate President Stephen Sweeney (D-Gloucester) wants to overhaul the state’s pension funding formula to make annual state pension contributions lower and more “manageable” over the next decade while preserving benefits for retirees. Sweeney’s plan to change the pension funding formula would save billions of dollars in pension payments in state budgets over the next decade, while still cutting the state’s unfunded pension liability for teachers and state government workers and retirees sufficiently to guarantee the solvency of the pension system. That unfunded liability is now expected to top $60 billion by FY18, up from $54 billion before Christie’s pension cuts. A pension system that has 85 percent of the funding it needs to cover all accrued pension obligations is clearly regarded as sufficiently stable to withstand losses from a major drop in the stock market and have time to recover while continuing to make payments. As of last year, New Jersey state government’s pension funding ratio of 54 percent was the fourth-worst in the nation, as the bipartisan Pension and Health Benefits Commission appointed by Christie pointed out in its interim report last month. With the $80 billion currently in the state’s pension portfolio and a $60 billion projected unfunded liability in FY18, the difference in cost between reaching an 85 percent funding ratio and 100 percent funding would be about $20 billion. The annual budget savings on state pension payments achieved by shifting to an 85 percent funding formula phased in over five to seven years and amortized over 30 years would most likely average $1.5 billion less than the projected $5.5 billion-a-year actuarially projected cost of a 100 percent funding formula at full phase-in, according to pension experts who asked not to be identified. That would be a significant annual savings in a state budget in which rising pension, retiree health care and debt service costs are crowding out other funding priorities, as Christie has warned. Influential PlayerSweeney’s proposal to “move in the goalposts,” as one pension expert put it, is important because it was Sweeney, an Ironworkers Union leader, who put his political career on the line as the chief author of the pension law that required the state to ramp up its annual pension contributions over a seven-year period to the full actuarially required funding level required to bring the various state and local government pension systems up to 100 percent funding by 2018. It comes as Christie’s pension commission is preparing its recommendations to cut pension and benefit costs. And it comes from the Democrat who is not only the Legislature’s leading expert on pension issues – an Ironworkers Union vice president who oversees his own union’s pension and health benefit funds — but also one who has the power as Senate president to block any pension proposal he does not like from coming to a vote. 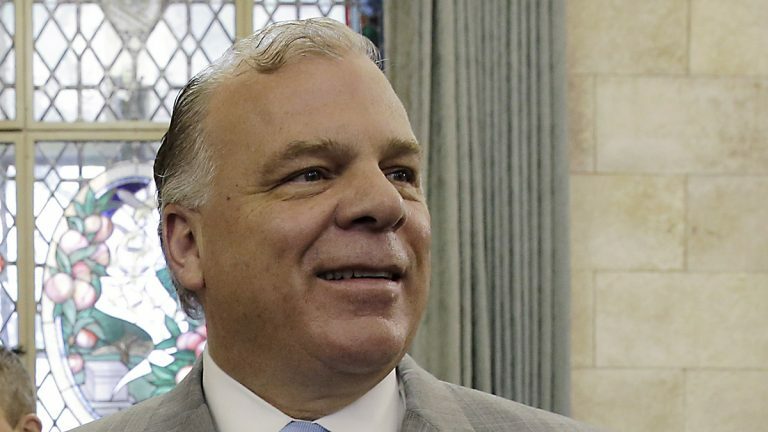 Sweeney’s proposal to shift the pension funding goal from 100 percent to 85 percent funded is critical in the wake of Christie’s decision to abandon the seven-year pension funding phase-in after just two years of payments. New Jersey’s pension crisis, which is one of the chief causes of the record eight credit downgrades by the bond rating agencies during Christie’s five years in office, was caused by the failure of past Democratic and Republican governors to make needed pension payments over the past 15 years. That was supposed to change under the pension laws that Sweeney and Christie teamed up to pass in 2010 and 2011. Under the seven-year phase-in, state government pension payments were scheduled to increase from $600 million in Fiscal Year 2012 and $1.1 billion in FY2013 to $1.7 billion in FY14 and $2.25 billion in FY15. By FY18, when the state would be paying the full amount needed to amortize the state’s unfunded pension liability over 30 years, the pension payment would have been $4.8 billion. Annual pension payments would have remained at that level for a decade or more, then would have dropped steadily to $1 billion by 2048, Sweeney said, citing an internal union pension analysis. When plummeting state income tax revenues created an unexpected budget crisis last spring, Christie retroactively cut the FY14 pension payment to $694 million and FY15’s payment to $681 million — the minimum required to pay current pension costs. Christie said he could not afford to pay for “the sins of past governors” — even though he had underfunded actuarially required pension payments by $14.9 billion during his first five budgets, more than twice as much as any previous governor. Big Impact on Pension PaymentsSweeney’s proposal to shift from a 100 percent funding target to a goal of 85 percent funding over a 30-year period would significantly reduce required pension payments in future budgets. Under the 100 percent funding target in the original law, the state would have had to make annual pension payments of about $5.5 billion a year by FY19 – an increase over the $4.8 billion originally projected for FY18 as a result of Christie’s pension cuts last spring. Sweeney said Christie knew it would be difficult to get to full actuarially required funding of the pension system by FY18 when he signed the law. “He chose to break his word,” Sweeney said. He noted that the Democratic-controlled Legislature sent Christie a budget that included $1.5 billion in income tax increases on the wealthy and corporate tax surcharges to put pension funding back on track this year, but Christie vetoed it. Sweeney’s proposal to shift to an 85 percent funding target would require the passage of legislation not only changing the target ratio, but also establishing a new phase-in schedule to replace the seven-year ramp-up to full actuarially required funding in the original 2010 law. In the meantime, however, Superior Court Judge Mary C. Jacobson is likely to rule on the lawsuit brought by the state’s public employee unions challenging Christie’s right to violate the 2010 law requiring him to make the scheduled FY15 pension payment of $2.25 billion this year. Sweeney expressed optimism that the judge would recognize that the Legislature clearly intended to create a contractual obligation for the state to make the required pension payments on schedule. That language was included specifically to counter an earlier court ruling in a 2009 case that while public employees had a contractual right to a pension, the state government had the right to decide when — or if — to make annual pension payments, Sweeney said. Meanwhile, a state appeals court has ordered a full Superior Court trial in a case challenging the provision in the 2011 law that suspended cost-of-living increases for retirees – a cut that accounted for $72 billion of the total $122 billion in cost savings anticipated over 30 years from the controversial measure. Sweeney noted that his 2011 pension law gave the joint labor-management committees that oversee the state’s pension funds the authority to reinstate cost-of-living increases once their funds hit an 80 percent funding ratio. While the pension systems for teachers and state workers are years away from hitting that target, the New Jersey State League of Municipalities and the New Jersey Association of Counties pointed out in a joint letter that the pension funds for both uniformed and non-uniformed employees are about 75 percent funded because counties and municipalities were required by the state to make the required annual pension contributions to keep their pension plans solvent. “Unless the market crashes, the next actuarial reports will likely show that the Public Employees Retirement System and the Police and Fire Retirement System for local employees are 80 percent funded,” noted John Loos, the former Communications Workers of America leader who co-chairs the New Jersey Retired Public Employees group. He said the critical issue is making sure that the state makes the required pension payments, whether the ultimate target is 85 percent funding or a 100 percent funding ratio.